Summer brings sunshine, barbecues and a lot of fun nights spent with friends, but across the country, every Fourth of July thousands of people turn their fun in the sun into a day spent in the hospital as many are injured while using consumer fireworks. In 2011, the U.S. Consumer Product Safety Commission (CPSC) conducted a study of firework injuries from June 17 to July 17. They found that on average, 200 people go to the emergency room every day due to firework-related injuries during the month around Independence Day. Four firework-related deaths were reported to CPSC in 2011, and it was confirmed that illegal and homemade fireworks were to blame. According to the National Fire Protection Association (NFPA), fireworks caused an estimated 17,800 reported fires, including 1,200 total structure fires, 400 vehicle fires, and 16,300 outside and other fires. US hospital emergency rooms treated an estimated 9,600 people for fireworks related injuries; 61% of 2011 emergency room fireworks-related injuries were to the extremities and 34% were to the head. The risk of fireworks injury was highest for children ages 5-19, and adults 25-44. On Independence Day in a typical year, fireworks are the cause of the majority of fires - accounting for 2 out of 5 conflagrations seen during this time of year. Males were most injured from firecrackers, sparklers, bottle rockets, novelty devices, Roman candles, and reloadable shells. ALL consumer fireworks are banned in New York State however, they are legal in many of our neighboring states such as Pennsylvania and New Hampshire, so it’s not uncommon to see them in New York during the holiday. Although they are illegal to purchase & use in New York State, New Yorkers get injured every year in firework related mishaps. 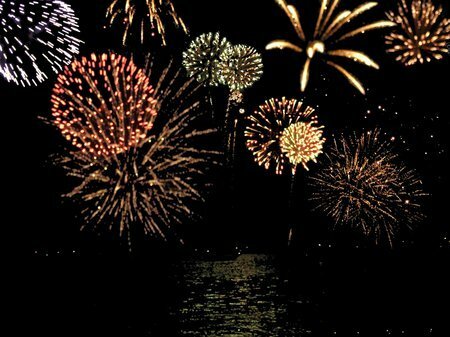 But getting injured isn’t the only thing they have to deal with - the New York State Department of Labor, has put forth a fine for $750 for setting off fireworks without a permit. Legal or not, fireworks are too risky for amateurs. Permanent scarring, loss of vision, dismemberment of body parts - these are too often the result of amateur firework use. The NFPA urges everyone to treat fireworks, whether they are legal or not for consumer use, as suitable only for professionals trained to use them. Making the decision to shoot off fireworks puts yourself endanger, and by lighting them around your neighborhood or around a wooded or highly populated area, they can harm innocent bystanders and the property and structures surrounding it. Never allow children to play with or ignite fireworks. Never try to re-light or pick up fireworks that have not ignited completely. Keep a bucket of water or garden hose accessible in case of a fire or other mishap. Never light more than one firework at a time, and make sure you step back quickly after lighting a firework. Keep emergency contacts on hand - Contacts for the police and your local fire department can be crucial when faced with firework hazards. You may not be the one using fireworks, but that doesn’t mean a neighbor or a family member is not either. A safe way to enjoy fireworks this Fourth of July is by going to a local firework display done by professionals. It’s a great way to get your family together to enjoy fireworks without putting a loved one in harms way. Bay Street Theatre’s Summer Music Theater Camps - Happening This July & August! Subject: LongIsland.com - Your Name sent you Article details of "Staying Safe During the 4th of July: Fireworks Safety Information & Startling Stats"